Just because you measure your strength on a barbell doesn't mean you should do everything with two hands on the bar and two feet on the ground. Unilateral training can benefit all strength athletes, as long as you approach it correctly. Powerlifters and other dedicated barbell hoisters are after three things: strength, size, and power—and the size and power are really only to add strength. They live to load the bar up and press, pull, and squat it for aggressive reps. Bars, plates, and collars are the tools of the trade. Surely, then, it seems like silly child's play to consider one-sided training, called unilateral training. Does unilateral training such as single-arm dumbbell rows and single-arm lateral raises have a place in a serious barbell lifter's training Rolodex? It definitely does. Unless you're Matt Kroc, you're definitely not going to move weights in single-leg movements that can be measured against your biggest lifts. But change your mindset a little, and you'll see that single-limb work can demand the same level of effort and bestow benefits that feed directly into the big lifts. Squats, deadlifts, and bench presses are special in that they demand full-body tension and strength. This is why heavy lifters often describe their weaknesses as "power leakages." To own those immense loads, they need their whole body to work like one giant muscle! 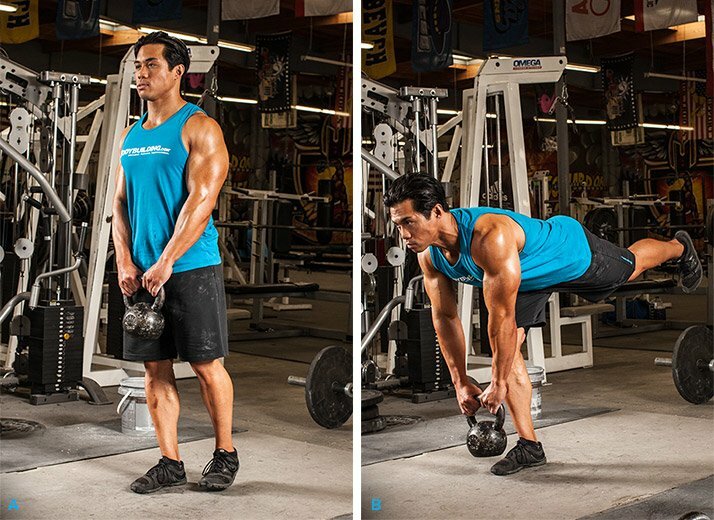 To push as much weight as possible in the big lifts, save room in your program for these single-limb assistance moves! Unfortunately, many of us are weaker on one side or the other in any given muscle group. It could be any group—legs, lats, glutes, arms, you name it. The outcome is the same: You can't generate max force when you're called upon to winch the barbell. Experienced lifters know that training limbs to be independently strong improves performance when they work in conjunction. So while those sets of single-leg squats might seem fluffy and insignificant, they also have the potential to add a few pounds to your back squat. But the key—and this is where people get it wrong—is that you have to load the exercises heavily enough. Single-leg squats, split squats, single-arm bench presses, and single-arm rows are all unilateral exercises that can be loaded aggressively. Unfortunately, most folks choose lighter weights and load these exercises for 8 reps or more. Allow me to shout it out: You can train single-limb movements heavily for 4-6 reps! This rep range, my friends, is where the magic happens. Strength imbalances get demolished, and when we return to the barbell, performance increases. Injuries inevitably occur in pursuit of strength. Of course I'd never encourage you to train damaged tissue, but I also maintain there's always something you can do. Too often, we let negative circumstances control our mindset and limit our actions more than necessary. So you hurt your knee or elbow—join the club! That doesn't mean you have to confine yourself to the training sidelines, sulking while all the other kids squat and deadlift. So you hurt your knee or elbow—join the club! That doesn't mean you have to confine yourself to the training sidelines, sulking while all the other kids squat and deadlift. For example, let's say your shoulder is too whacked for back squatting right now. Can you still hold two dumbbells for some single-leg squats and lunges? Great! Or maybe it's your left wrist. Squats, deads, bench—they all aggravate it. Well, your right wrist is perfectly fine, so train your right arm! It can still press, pull, and carry weight. Several research studies have found that training the noninjured limb actually promotes strength in the injured limb via neurological crossover (referred to as cross-education).1 So, not only are you making progress, you're helping your affected limb maintain strength. The great thing about having four independently moving limbs is that they can all be trained independently. I know that seems redundant, but coaches know that the easiest way to accrue mass is to increase training volume. The problem is that an increase in heavy bilateral work often means increasing stress beyond your body's recovery capabilities. Unilateral training, on the other hand, allows for comparatively low-consequence volume increases. The exercises don't drain the nervous system nearly as much as the big lifts, but they're stressful enough on the musculoskeletal system to make a positive change. It's in this instance that higher-rep unilateral training is appropriate. 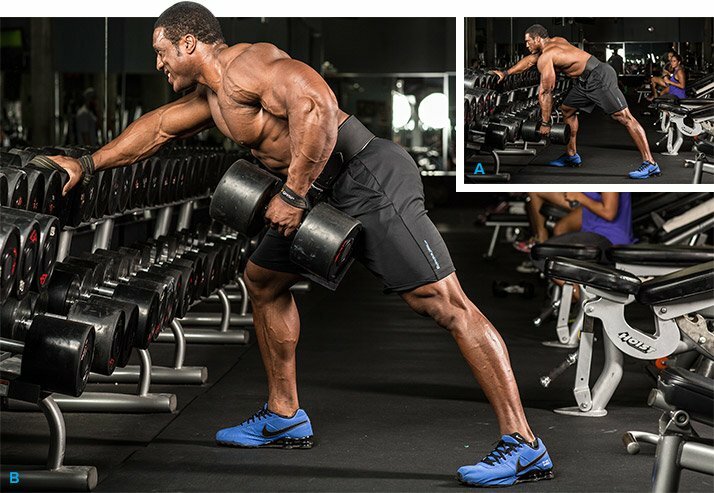 Sets of 8-12 with lunges, presses, rows, and single-leg deadlifts are all great ways to accumulate training volume that will lead to mass gain without inhibiting recovery. When Should the Strength Athlete Train Unilaterally? Where am I at in my training phase? Let's say that the goal is overall strength in the three big barbell lifts. In this circumstance, there's no substitute for loading a barbell and yoking it with both arms or both legs. Bilateral training is the ultimate strength-gaining approach, particularly if that's your competitive sport of choice. Programming heavy single-limb lifts early in the training year builds the strength balance needed for optimal barbell strength. So where does unilateral training fit into a plan to achieve this? In early training phases, and as assistance training. Programming heavy single-limb lifts early in the training year builds the strength balance needed for optimal barbell strength. So if you want to achieve your goals in November, spend time in January, February, and March using heavy unilateral lifts. This is also a great time to include higher-rep unilateral training to build training volume. During the middle of the training year, bump unilateral lifts to an assistance role. It's at this point that barbell training takes the main focus and unilateral lifts become the dessert needed to maintain strength balance. Reps are still varied between low and high, but the total volume of single-limb lifts decreases. If you're building up to a single big event, eliminate unilateral lifts from the final 12 weeks of training. It's during this time that your barbell technique is harnessed and the most specific exercises are used to build strength in the three big lifts. Follow that calendar, and your one-sided efforts will make you a better barbell lifter! Munn, J., Herbert, R. D., & Gandevia, S. C. (2004). Contralateral effects of unilateral resistance training: a meta-analysis. Journal of Applied Physiology,96(5), 1861-1866.